This is a women's coral pink soft underwire bra. 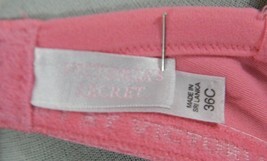 Manufacturer information reads: Body by Victoria's Secret. Size: 36C. Material: 60% nylon/40% lycra spandex. Measurements: band unstretched/stretched 27-32". In good used condition. Smoke free home. No holes, stains or rips.